Do you want to get The Last Best Box or send it as a gift, but can't wait until the next month's box is shipped? 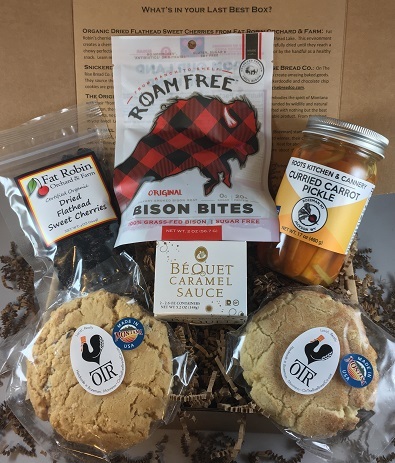 Consider one of our November "Fall Foodie" Boxes! It includes Organic Dried Flathead Sweet Cherries from Fat Robin Orchard & Farm (Finley Point), Snickerdoodle and Chocolate Chip Cookies from On The Rise Bread Co. (Bozeman), The Original Bison Bites from Roam Free (Hot Springs), Caramel Sauce Cups from Bequet Confections (Bozeman), and Curried Carrot Pickles from Roots Kitchen & Cannery (Bozeman). **This box is separate from the monthly subscription, and can be shipped anytime. We use USPS 1-3 priority mail, and generally ship your box 1-3 days after you place your order. Contact us if you have any special instructions! Cheers!